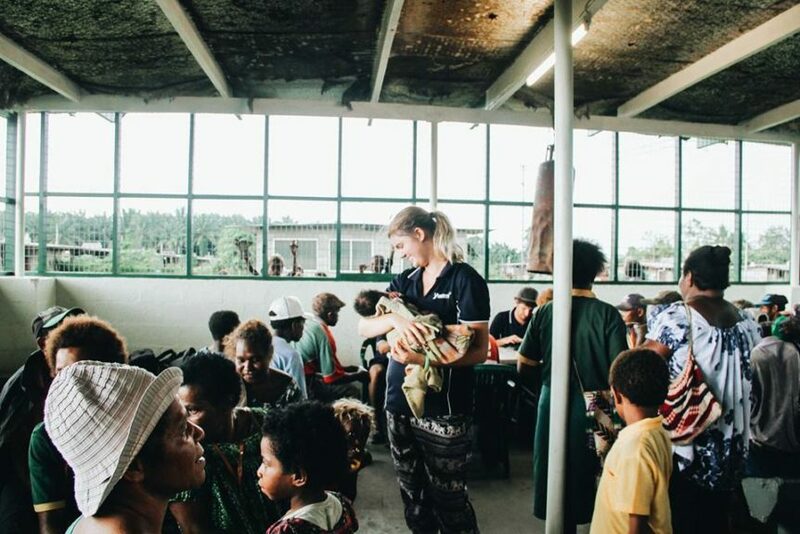 I had been in Kimbe, Papua New Guinea, for only a week, having joined two Discipleship Training School teams already ministering out of the m/v PACIFIC LINK — a YWAM medical and training ship. Now I found myself in the pediatric unit of the local hospital, feeling unprepared to minister. The staff had done their best to make the ward as cheerful a place as possible. Photos of animals hung on the off-white walls and they had painted the ceiling beams a bright yellow. I, however, didn’t feel very cheerful. I felt sad, even a little angry. It seemed so cruel and unjust that these innocent little ones had to suffer. Several babies lay on the beds; a couple of them arched backwards, feverish or unresponsive. One mother told me her child had been hospitalized for malaria, something that could easily have been prevented. Each of the tiny patients had one or more family members with them. Sometimes the family circle included brothers or sisters. We gave the children balloons to play with, engaging some of them in games of “balloon volleyball.” Some were too sick or young to benefit so their siblings took advantage of the opportunity for some fun. Most importantly, we prayed for each child and his or her parent. I returned with the team the next day. Again, we prayed for the parents and their children. I could not imagine watching my child’s misery, helpless to relieve their pain. Tears rolled down one mother’s cheeks as she told me her child had been in the hospital for a week. I looked at the baby, arched backward, head bent back towards his spine, covered in wet cloths, presumably to bring down his fever. We had been there almost an hour when one of my teammates took up his guitar and began to strum worship music while others on my team sang along. This was just one more of the things we hoped would bring peace and joy to the ward. Then one of the babies began to writhe and cry as though in serious pain. The mother tried to comfort him but to no avail. His distress deeply disturbed me. I went over to the bed and laid my hands on the child, praying and interceding for God to be merciful and bring peace and relief. I had prayed for him for only a few minutes when he began to calm and soon went back to sleep. Perhaps he was healed. Perhaps not. We never know what God is doing unseen and in faith. I believe God used my prayers to bring that baby peace.